Vintage Champagne is investible: Production and therefore supply is restricted and vintage Champagne maintains an incredibly strong consumption market, readymade in nightclubs, hotels, restaurants and private members clubs around the world. The remainder goes to private collector’s portfolios or cellars, they buy within a few years of release and as a result pay a lot less in the future when they choose to drink it, or alternatively resell it for a profit. The leading Champagne houses produce many cuvees, or Champagne styles; non-vintage and vintage. Non-vintage champagnes are made to provide a continuous house style by blending grapes from different vintages. After first fermentation these Champagnes are transferred into bottle where they undergo a second fermentation and rest on the lees, the by-product of the fermentation, for a minimum of 15 months: most leading estates age on the lees for longer, adding to the complexity of flavour. Vintage Champagnes, however, come from a single vintage/harvest, selected only in good to great years, such as 1990, 1996, 1999, 2002 and 2004. Champagne Houses will produce vintage Champagne in most years, not all, but are even more selective about their prestige cuvee, for example vintage Louis Roederer is produced more frequently than their prestige cuvee Cristal. Instead of 15 months ageing on lees, Vintage Champagnes have a minimum of 36 months, although the leading vintage Champagnes tend to be aged for much longer before being released to the market. The leading Champagne houses will generally release the wine to market when they believe the champagne is ready for consumption and not necessarily in chronological order. This ageing process results in the Champagnes having much longer contact with the lees, where they derive their biscuit, brioche and nutty flavours that gives the Champagne more complexity, while protecting it so that it can age for longer in bottle and develop incredible depth and precision. The ageing process also results in smaller more refined bubbles. Once a vintage is made it can never be remade and once released to market each vintage is steadily consumed, meaning that as the quality improves, the supply decreases, creating an inverse supply curve. Production of these prestige cuvee tends to be very small and cannot meet global demand, Salon Mesnil makes less than 3,000 cases a year, while Cristal fewer than 25,000. Which houses are best to invest in? 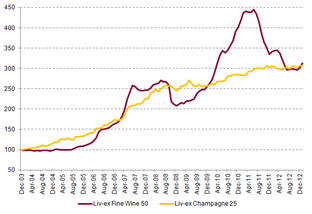 The performance of vintage Champagne in recent years has been excellent; with the Liv-ex Champagne Index steadily outperforming the Bordeaux focused 50 and 100 indices. The Liv-ex Champagne index is made up of the leading vintage prestige cuvees: Krug Brut; Louis Roederer, Cristal; Moet & Chandon, Dom Perignon; Taittinger, Comtes de Champagne and Salon Mensil. We also include Bollinger’s Grande Annee due to its growing global cachet and stellar performance. These wines constitute the backbone of investing in Champagne and should form approximately 80% of any Champagne investment. We have extracted data for the aforementioned wines, from the 1985, 90, 96, 00, 02 and 04 vintages where releases exist, Krug is yet to release 2002 and 2004. Over the 12 months these Champagnes have returned 12%, Bollinger performed best, increasing an average of 28.35%. Over five years this basket of vintage champagne has returned 24.25%, just under 5% per year. This is compelling when one considers the macro economic downturn experienced during this period. If we view this by vintage the dissemination of returns tends to point to the fact that returns are evenly distributed amongst vintages although they start to perform very well a year after release to market and then for the next two to three years: buying after year two and holding to year five is rewarding. New markets are stretching production of these leading wines and the houses cannot increase their output to meet this demand. Rapid global wealth creation has meant many more people want to own and drink the world’s leading Champagnes and prices over the next five to ten years are set to rise further. Where should one store wines for investment? The UK is one of the largest hubs of fine wine in the world with an estimated £1.5 billion of fine wine stored in bonded warehouses. Champagne stored ‘under bond’, is not subject to duty or VAT either on purchase or resale, only when released for consumption. When collectors wish to take delivery of their Champagne we arrange VAT and duty to be paid and the case released within 48 hours in the UK; worldwide delivery is available using experienced and efficient wine carriers. The advantage of the bonded system is that the wines provenance can be guaranteed and as such any sale of goods will be expeditious. Moreover, collectors can age their wine in perfect conditions with full confidence of the wines safekeeping. Its average temperature is maintained at 13 degrees Celsius (55.4 degrees Fahrenheit) and a humidity level of 60-65% which creates the optimal condition for storing fine wine. All assets stored with IG Wines are insured at market value. Storage and insurance is charged at £10 per case per year pro rata.